As part of the GRAHAM BONNET BAND's 2017 The Book tour in Japan, a three-night special engagement and reunion of ALCATRAZZ was presented much to the delight of the Japanese hard rock faithful! On December 7, 2018, Frontiers Music srl will release Parole Denied - Tokyo 2017, a special documentation of these special shows on 2CD/DVD and Digital formats. Today, fans can enjoy "Skyfire" taken from the DVD on KNAC.COM HERE. Additionally, the GRAHAM BONNET BAND has announced a U.S. tour where they will be performing the first ALCATRAZZ album No Parole From Rock N Roll from front to back along with the other hits from their and Graham's catalog. 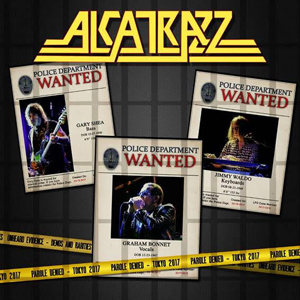 ALCATRAZZ was formed in 1983 by former RAINBOW and Michael Schenker vocalist Graham Bonnet along with Jimmy Waldo and Gary Shea and they would go on to make three studio albums in the 1980s. The band’s debut album included a young Swedish guitarist, Yngwie Malmsteen and their second album featured guitar virtuoso Steve Vai. ALCATRAZZ split up in 1987 after the release of their third album, Dangerous Games.